Chocolate and creativity. A day with the InterCIDEC jury 2018. 13 Dec Chocolate and creativity. A day with the InterCIDEC jury 2018. Just because not everything is work, during the journey dedicated to the election of the interior design projects of InterCIDEC 2018, there was also time for the imagination. Taking advantage of the meeting with such relevant and creative personalities in the sector of interior design, architecture and hospitality channel as Diego Gronda, Pepe Seguí, Mónica Fullana, Rafa Fraile, Pepe Costa, Marta Farré or Mari Carmen Ayala among others, we couldn’t lose the opportunity of carrying out an activity in order to show their creativity and ingenuity. And there isn’t a better resource than chocolate and a white wall where to translate all that InterCIDEC inspired to them. An unforgettable day of work, collaboration and creativity. The intense journey was marked by several points to highlight, but no one of them was so sweet as this chocolate moment. Taking advantage of having this jury, we proposed to carry out a creative activity, in which there was a board on which they could paint, with chocolate!. The members of the jury started to draw whatever they could imagine or think at that moment. 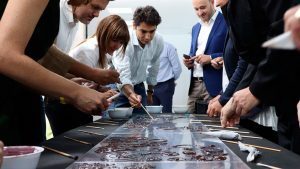 Later, the board became on a huge chocolate bar, on which every one added their own ideas and creativity. A morning in which the design was the main protagonist. 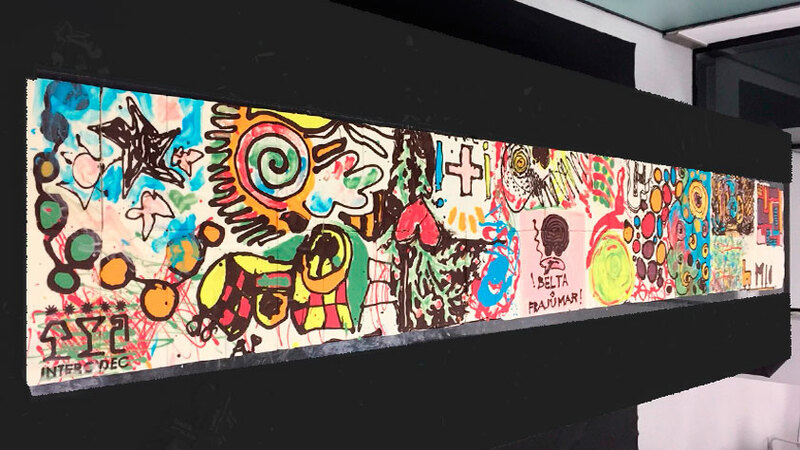 The result was a group artwork, and every one of the members of the jury participated. 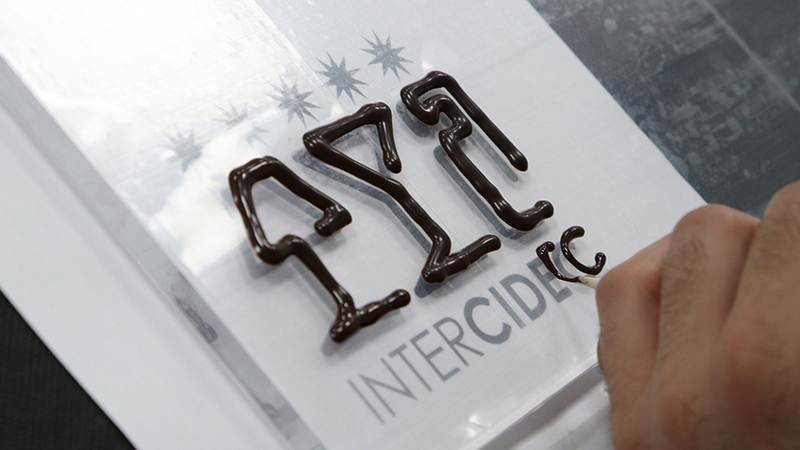 In this chocolate bar, we could see the InterCIDEC logo or some abstract draws. After a whole morning where the interior design was the main protagonist, nothing was randomly done. Who knows if some of the members would leave a hidden message, like a hieroglyphic. What is sure, is that it was a unique work that nobody expected, so it was an improvised chocolate paint with a great visual value. Finally, each one could take a piece of this huge chocolate painting, so the paintwork will remain in the pictures. without a doubt, it was a very special and original activity that felt very well. Interviews with the members of the jury 2018.